When markets are new they are unproven, thus they often have limited investment targeting them. That in turn means it can be easy to win in new markets just by virtue of existing. It wouldn't be hard to rank well creating a blog today about the evolution of the 3D printing industry, or a how to site focused on Arduino or Raspberry Pi devices. Couple a bit of passion with significant effort & limited competition and winning is quite easy. Likewise in a small niche geographic market one can easily win with a generic, because the location acts as a market filter which limits competition. But as markets age and become more proven, capital rushes in, which pushes out most of the generic unbranded players. Back in 2011 I wrote about how Google had effectively killed the concept of category killer domains through the combination of ad displacement, vertical search & the algorithmic ranking shift moving away from relevancy toward awareness. 2 months before I wrote that post Walgreen Co. acquired Drugstore.com for about $429 million. At the time Drugstore.com was one of the top 10 biggest ecommerce pure plays. Other retailers have picked up pure-play e-commerce sites, only to shut them down shortly thereafter. Target Corp. last year shuttered ChefsCatalog.com and Cooking.com, less than three years after buying them. The lack of publishing savvy among most large retailers mean there will be a water cycle of opportunity which keeps re-appearing, however as the web gets more saturated many of these opportunities are going to become increasingly niche options riding new market trends. If you invest in zero-sum markets there needs to be some point of differentiation to drive switching. 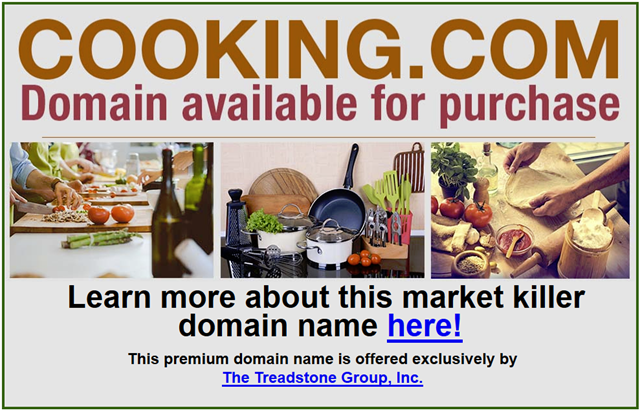 There might be opportunity for a cooking.com or a drugstore.com targeting emerging and frontier markets where brands are under-represented online (much like launching Drugstore.com in the US back in 1999), but it is unlikely pure-play ecommerce sites will be able to win in established markets if they use generically descriptive domains which make building brand awareness and perceived differentiation next to impossible. Target not only shut down cooking.com, but they didn't even bother redirecting the domain name to an associated part of their website. It is now listed for sale. Many short & generic domain names are guaranteed to remain in a purgatory status. The price point is typically far too high for a passionate hobbyist to buy them & attempt to turn them into something differentiated. The category-killer domains that have audience building potential remain quite valuable, although as you note, Big Brands are not in the audience building business. I hope they sell off the domains, so they can be recycled. However, once Big Brands find themselves re-purchasing the same domains again, they might stop letting them be recycled. That would be a bad move, because obviously the rebuilt business is worth buying...but Big Brands make bad moves all the time. Definitely not easy to restart on a domain already aftermarket priced in the millions, though. So why not partner? Why not donate domain to be rebuilt for acquisition, when ripe? Because public companies are not smart enough to compete with themselves. I agree, SEO is more a part of brand building and an essential strategy going forward to get your website found than ever before. The problem is, particularly in the UK, getting the smaller clients to realise how essential SEO actually is. Even e-commerce SEO for small-medium sized businesses is getting nichy, which I guess is a good thing in a way as it makes some keywords easier to rank. But we will have to wait and see what happens to Wallgreens sites to form an opinion on what their strategy going forward is with these domains.